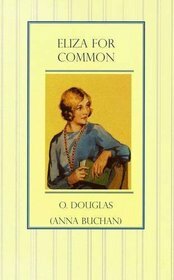 Every so often,a mention of O Douglas (the pseudonym of Anna Buchan, sister of John) pops up on one or another of my favourite book blogs. Not with any real regularity, but enough to intrigue me with promises of cosy domestic stories, frequently set in Scotland. Now, as we all know, there are few things I love more than cosy domestic stories and though most of what I read is set in England that is only because not enough writers were intelligent enough to please me by writing about Scotland (except D.E. Stevenson – bless her). So I have read reviews of Douglas’s books with interest when they appear – Lyn is a fan and Barb has recently been reading O Douglas too – and determined that I must try her for myself. I started, back in June, with Eliza for Common, published in 1928 and reissued in recent years by Greyladies (though mine was an old library edition). Eliza for Common is the story of Eliza Laidlaw, beginning in the winter of 1919/1920 when Eliza is a callow schoolgirl of sixteen. Eliza is the only girl in a family of boys. She is utterly devoted to her elder brother Jim but there are also two delightful younger brothers – Rob and Geordie – and one dead, fondly remembered brother, who was only a couple of years younger than Eliza. And then there are the ever-dependable Reverend and Mrs Laidlaw. The Reverend comes across as a bit of a sad figure, devoted to his work in Glasgow’s poorer neighbourhoods but never so happy as when he’s out of the city, holidaying in the Borders. Mrs Laidlaw is a bit harder to define. She is reliable and esteemed by all her friends but seems almost spiteful towards her daughter, beyond the reasonable reaction to the arrogance of youth. Eliza herself is a handled quite unsympathetically, which is impressive given how autobiographical this book is about Anna Buchan’s own family life. She is ridiculous and pretentious, and can be thoughtless and unsympathetic – like most young people. She hurts her parents by criticizing their ways and trying to impose her views over theirs in their own house. She does not do it maliciously, just out of a longing for a different kind of life, one her mother cannot even begin to understand. Eliza is dutiful and loving but she has a mind and a temperament ill-suited to the gloomy Glasgow house. She reads her brother Jim’s letter from Oxford enviously, desperate for the glamour of his surroundings. She wants adventure and has the blessing of a good sense of humour and child-like wonder that allow her to make the most of any experience she gets. Eventually, Eliza does get to leave Glasgow and see at least a little bit of the world. She visits England, getting to see the long-dreamt-of beauties of Oxford, and goes with her brother to Paris and Switzerland. And what she finds delights her. Growing up, Eliza had always felt that she would be better suited to more sophisticated surroundings and companions and finally as a young woman in her early twenties that is exactly where she finds herself, finally able to feel at home though she is miles away from her family. I have now read four of Douglas’s books (Eliza for Common, Penny Plain, Priorsford, and Taken By the Hand) and I have to say that I think this is the weakest. The style is appealing – light and cosy, like a second-rate D.E. Stevenson – but the story and characters are lifeless. The personality clash between Eliza and her mother intrigued me, since the challenges of adult daughters living at home are all too rarely addressed when the daughter is anything other than a doormat or the mother anything other than an invalid, but it remained subdued throughout the book. The romantic entanglements (though entanglement seems too active a word for these tepid pairings) were mind-numbingly dull. There is no sense of romantic tension between Eliza and her future husband and there was certainly no dialogue to show the progression of the relationship. I finished the book with really no clear idea of his personality but, since I did not particularly care about Eliza, I was not overly worried. Though I could sympathize with some facets of Eliza’s character, she never crossed the line from sympathetic to likeable. Despite my quibbles, this is still a sweet book and served as a nice introduction to Douglas’s work. It is just not particularly memorable. I was wracking my brain to remember enough details to write this review and it has only been two months since I read it. Douglas writes charming, unchallenging prose that would be perfect for the sick room or certain lazy moods but, if taken in large doses, could quickly feel insipid. I have read quite a few of her books but not this one. I started to read Ann and her Mother, and gave up, finding it so lacking in substance, and I didn’t even feel the cosy home life like the others. You must read The Proper Place? (not got it here just now) and The Day of Small Things, then Jane’s Parlour. Please check these titles as they’re in another room and I’m upstairs and don’t want to go and start looking for them. They have a story, in the usual “we only have 7 servants and 13 bedrooms” type of way! 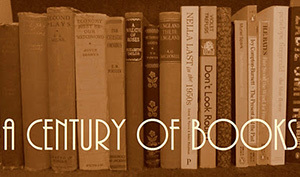 Still, I have really enjoyed reading them. Pink Sugar was – just that, OK! Penny Plain and Priorsford I enjoyed immensely. Another book which was my first ever O Douglas Book, a House that is Our Own, I loved, apart from not liking the ending particularly but the rest was lovely. I loved The Proper Place and have my copy of The Day of Small Things standing by to be read this year as part of my A Century of Books reading project. I only hope that Greyladies will reissue Jane’s Parlour soon! Have you read Taken By the Hand? So far, that’s one of my favourite O. Douglas books. I’m also a big fan of Olivia in India (or, just Olivia).